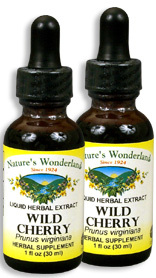 Wild Cherry Bark Liquid Extract, 1 fl oz / 30 ml each (Nature's Wonderland) - Penn Herb Co. Ltd.
Wild Cherry Bark was used by several North American tribes for calming the throat, and today it's still one of the most requested herbs for supporting the respiratory system and for soothing the mucus membranes of the throat and bronchial passages. 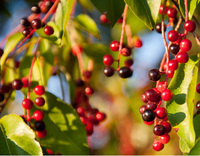 AMOUNT PER SERVING (333mg/ml or 30 drops): Ethically Wild Harvested Wild Cherry Bark (Prunus virginiana). OTHER INGREDIENTS: Grain Alcohol (50-60% by volume), Deionized Water. Free of: milk, dairy, egg, fish, shellfish, tree nuts, peanuts, wheat, gluten or soy. Supports healthy respiratory function; soothes mucus membranes of the throat, bronchial and respiratory system; helps maintain free, clear breathing. 30-60 drops in water or juice, 2-3 times daily, or as needed. Shake well before using.